All it takes to jump start a party or turn an ordinary gathering into a rollicking one is a bowl of hot and spicy crackers. Crackers are recognized the world over as classic party food. However, this certainly does not mean that they cannot be enjoyed on an ordinary day when the craving sets in. In fact, they are extremely easy to make, and you don’t need anything other than a few common ingredients that can be found in most kitchens. They also do not take much time and can be made on short notice, when friends come calling without prior warning. Take out some soda and a bowl of crackers, and you are bound to have a great time. Take a large zip lock bag; it should be around one gallon large. Add to it the oil and the ranch dressing. Seal the bag and mix these two ingredients together thoroughly. Any spices that you want to coat the crackers with can be added at this stage. After the oil and ranch dressing are mixed thoroughly, add the red pepper flakes. Although the quantity of the pepper is mentioned above, it can be altered according to your personal preferences. Some people like to go heavy on the pepper, while others like it mild. Make sure that the pepper flakes are thoroughly crushed, so that their flavor comes out fully. Now, add the crackers to the zip lock bag. Toss them in, zip the bag and turn it over many times to coat the crackers with the mixture. All the crackers should be well coated with the mixture so that they taste equally good. If you feel that the mixture is not enough to coat all the crackers, you can make some more in a separate bowl and pour it into the zip lock pack. Crackers taste best when they are allowed to rest for a day in the mixture so that they absorb the flavoring and the oil well. However, if you are short on time, they can be used instantly after thoroughly mixing them with the coating. 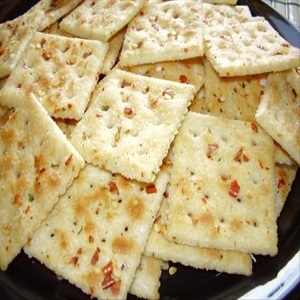 Crackers can be eaten on their own and can also be enjoyed with most dips. They can also be added to salads for flavour and texture.